Most of our food is poisoned with corn and corn derivatives, oxalates, plasticizers, tinned vegetables, heavy metals, DEHP, PVC, xenoestrogens, phthalates, nitrites, nitrates anyway. so most of it isn't really food. Don't worry about methane gas in landfills, not here in the USA... because the modern landfills reclaim that gas. yet, half earth's population doesn't have enough to eat..
Chickens solved my food waste problem. They are less picky than a pig. Another untrue article by this agency. what do you expect from a bunch of spoiled fat americans? stop eating you pigs!!!!! Mad we still run the world? Come to America and be great or keep living where you are and be sh!t. Did you read the article? The reason we are throwing food away is because we arent eating it. Stupid Euro Trash. Doesn't surprise me. Especially in the schools where the kids often throw away the foods that are the most nutritious.It's been said schools have the healthiest garbage cans in America. Sad. I agree this is not surprising, but schools, really? Tip of the ice berg, and at least the food is being put in front of someone. Have you worked in the food industry? A fast food chain disposes tons (literal pounds) of unsold product –every– night. I'm talking dumster full each night. Now imagine every McD's, BK, KFC, PizzaHut, etc you drive past every day to work. Tons every night in the trash. The entire country. Yeah, but RF said "nutritious" food. McDonalds and BK dumpsters aren't nutritious. I do have a job that puts me in schools from time to time and last time I was in one I saw two totally untouched apples sitting on top of the trash bin. All the food, I buy, I eat! Nothing gets throw out! 40 percent of that food gets throw out! I guess, it depends on the person! If you eat out all the time! Why stuff the frig with food to throw out! Thats a waste of food! And money! You could save all that money on throw out food! Or buy food in cans and check the expire date! Thats only common sense! I'll tell you one thing! If your living on food stamps and just getting by! You! don't throw out NOTHING! Unless your breeding kids just to get more FOOD STAMPS! The waste is in the food and catering industry. . What a personal family throws out is pennies on the 1,000 dollar bill in comparison. When I was a kid, my mother would really get on my case if I didn't clean my plate. "There are starving people in China who would love to have what you don't want to eat" she would say. Then one day I said, "Name one". Couldn't sit down for a week! I am amazed at how picky people are now days. I'm in my sixties, and growing up, you ate what was served. If there was anything left over you put it in a container, put it in the refrigerator and had it a couple of nights later, or used it as ingredients for something else. We raised OUR family along the same lines. And you N-E-V-E-R wasted meat! Even now, we still try to use up all leftovers. I keep hearing stories about families we know that don't like leftovers, so if there is food remaining at the end of a meal, they just throw it away. Now, I am not advocating eating month old leftovers, but use some sense. Sometimes allowing to marinate a day or two makes them even better. If you throw away leftovers and you have trouble stretching your food budget – no wonder! The article does not talk about how much energy goes into producing the food that is wasted which is immense. Like anyone can even know that. I counted the word waste about 20 times so lets stick to the subject. If someone is trying to make a living selling food they are going to try to use up or reuse every thing they can. So what is left is waste and not worth selling or cant be sold. Sure some of this can be used or reused but most of it cant. 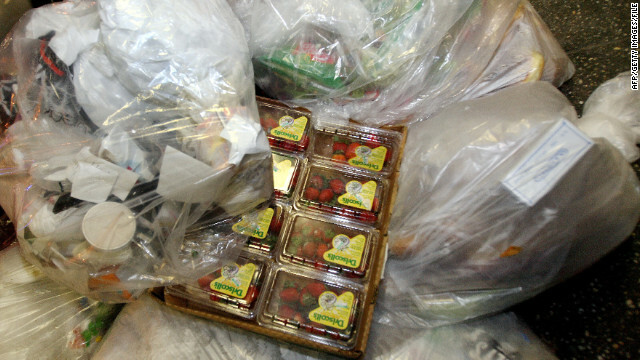 Should we pay for good produce when we are getting something that really should be put in the dumpster. Yeah, but I think that misses the point of the article. Such as stores purposefully over-ordering food knowing it will cause spoilage just so their stores look full or manufacturers changing packaging to things like holiday packaging knowing half the product will be thrown out while still good simply because of the packaging. WHY the food is wasted really isn't tho point so much as a lot of the issues can actually be addressed if we wanted to. This country deserves a famine!!!!!!! One of the top exports in this country is food so if their is a food shortage here their will also be a food shortage of some items in other countries. Like corn and wheat etc.